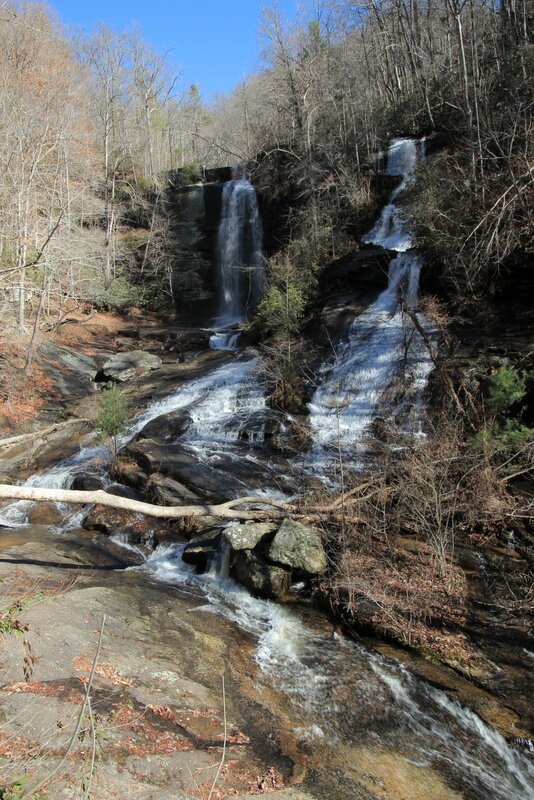 We will hike in the Oconee State Park to Station Cove Falls. This hike is moderately strenuous at 5.0 miles and 800 ft elevation change.. This is the hike that was rained out on Feb 19. We will be hiking from Panthertown Valley to Schoolhouse and Granny Burrell Falls. This hike is moderately strenuous at 6.0 miles and 750 ft total ascent. We will hike a moderately strenuous 5.5 miles with 1400 ft. of elevation in the Jim Timmerman Natural Resource Area to see the petroglyphs on Pinnacle Mountain. This hike starts at Burrels Ford on the Chattooga River then on to Kings Creek Falls. This hike is along the river. This hike is moderately strenuous at 5.0 miles and 300 ft elevation change. This will be a hike to the top of Table Rock. This hike is strenuous at 6.5 miles and 2000 ft total ascent. The hike will ascend steeply through an open forest strewn with boulders. Along the way, you will see vegetation typical of the Southern Appalachians: dominant oak and hickory trees with scattered pines and hemlock. This hike offers many spectacular views. We will do a hike in the Pisgah National Forest. It will be a loop hike to Slate Rock. This hike is moderately strenuous at 3.7 miles and 850 ft elevation change. Here are a few pics by Paula Swartz from our 2016 hike. A new hike on Pickens Mountian Trail. This hike is moderately strenuous at 6.2 miles and 1500 ft. total ascent. This is a loop hike from Glady Fork to the Foothills Trail.The hike is moderately strenuous at 4.4 miles and 1200 ft. total ascent. Ticoa Dam Park parking area to Nantahala National Forest to hike to the Yellow Mountain Fire Tower, 3 miles, 700 ft elevation change; followed by a hike to Whiteside Mountain, 2.5 miles, 600 ft elevation change.. The hikes are moderate. Hiking boots are required. Bring plenty of liquids, lunch and $5 for gas if you won’t be driving. HIKERS On Tuesday, July 17 at 9 am, we’ll carpool from the Ticoa Dam Park parking area to the Blue Ridge Parkway for a loop hike on Flat Laurel Trail to Wildcat Falls. This hike is moderately strenuous at 6.4 miles and 1000 ft. total ascent. Hiking boots are required. Bring plenty of liquids, lunch and $5 for gas if you won’t be driving. HIKERS On Tuesday, July 10 at 9 am we’ll carpool from the Ticoa Dam Park parking area to the Jocassee Gorges area for a hike to High Falls on the Thompson River followed by White Owl Falls. This hike is moderately strenuous at 3.5 miles and 250 ft. total ascent with a knee-high river crossing. Hiking boots are required. Bring plenty of liquids, lunch and $5 for gas if you won’t be driving. HIKERS On Tuesday, July 3 at 9 am we’ll carpool from the Ticoa Dam Park parking area to the Blue Ridge Parkway for a shuttle hike on the Shut-in Trail from Elk Gap Overlook to Big Ridge Overlook. This hike is moderately strenuous at 4.2 miles and 1020 ft. total ascent. Hiking boots are required. Bring plenty of liquids, lunch and $5 for gas if you won’t be driving. HIKERS On Tuesday, June 26, 2018 at 9 am, we’ll carpool from the Ticoa Dam parking area to Pisgah National Forest to hike to Shuck Ridge Creek Falls. This hike is strenuous at 7.8 miles and 1550 ft total ascent. Hiking boots are required. Bring plenty of liquids, lunch and $5 for gas if you won’t be driving. HIKERS On Tuesday, June 19 at 7 am – early start time – we’ll carpool from the Ticoa Dam Park parking area to the Roan Highlands (2.2 hr drive) for a hike on the Appalachian Trail. This hike is moderately strenuous at 5.6 miles and 1450 total ascent. Hiking boots are required. Bring plenty of liquids, lunch and $10 for gas if you won’t be driving. For info, call Tucker at 883-8831. HIKERS On Tuesday, June 12 at 9 am, we’ll carpool from the Ticoa Dam parking area to Pisgah National Forest to hike to Kuykendall Falls. This hike is strenuous at 6.8 miles and 1070 ft. total ascent. Hiking boots are required. Bring plenty of liquids, lunch and $5 for gas if you won’t be driving. For info, call Tucker 883-8831. Kuykendall Falls is seldom visited. It is somewhat remote and there is no trail for the steep climb down to the falls. Due to the steep bushwhack, the hike is rated as strenuous. Rich Stevenson describes it as a 10-mile hike, but we know a shorter route. HIKERS On Tuesday, June 5 at 9 am we’ll carpool from the pool parking lot to Jocassee Gorges Park for a hike to the waterfalls on the Horsepasture River. This hike is moderately strenuous at 5.0 miles and 1300 ft total ascent. Hiking boots are required. Bring plenty of liquids, lunch and $5 for gas if you won’t be driving. For info, call Tucker 883-8831. CANCELLED! – HIKERS On Tuesday, May 29 at 9 am, we’ll carpool from the pool parking lot to Pisgah National Forest to hike to Kuykendall Falls. This hike is strenuous at 6.8 miles and 1070 ft. total ascent. Hiking boots are required. Bring plenty of liquids, lunch and $5 for gas if you won’t be driving. For info, call Tucker 883-8831. HIKERS On Tuesday, May 22 at 9 am, we’ll carpool from the pool parking lot to Pisgah National Forest to hike to Twin Falls on Avery Creek. This hike is moderate at 4.0 miles and 870 ft. total ascent. Hiking boots are required. Bring plenty of liquids, lunch and $5 for gas if you won’t be driving. For info, call Tucker 883-8831. HIKERS On Tuesday, May 15 at 9 am, we’ll carpool from the pool parking lot to the Blue Ridge Parkway to hike to Devil’s Courthouse. This hike is moderate at 5.0 miles and 850 ft. total ascent. Hiking boots are required. Bring plenty of liquids, lunch and $5 for gas if you won’t be driving. For info, call Tucker 883-8831. HIKERS On Tuesday, May 8 at 8 am, EARLY START TIME – 2 HR. DRIVE, we’ll carpool from the pool parking lot to the Appalachian Trail for a shuttle hike from Max Patch to Lemon Gap. This hike is moderately strenuous at 6.0 miles and 1000 ft. total ascent. Hiking boots are required. Bring plenty of liquids, lunch and $10 for gas if you won’t be driving. For info, call Tucker at 883-8831. HIKERS On Tuesday, May 1 at 8 am, EARLY START TIME, we’ll carpool from the pool parking lot to the Pisgah Inn for breakfast followed by a shuttle hike on Buck Springs Trail. This hike is moderately strenuous at 6.0 miles and 1200 ft. elevation change, mostly downhill. Hiking boots are required. Bring plenty of liquids, lunch and $5 for gas if you won’t be driving. For info, call Tucker at 883-8831. HIKERS On Tuesday, April 3 at 9 am we’ll carpool from the pool parking lot to Oconee State Park to hike to Station Cove Falls and historic Oconee Station. This hike is moderately strenuous at 7.0 miles and 1540 ft total elevation gain. Hiking boots are required. Bring plenty of liquids, lunch and $5 for gas if you won’t be driving. There is a $5 per person fee to enter Oconee State Park. For info, call Tucker at 883-8831. HIKERS – On Tuesday, April 10 at 9 am we’ll carpool from the pool parking lot to the Chattooga River to hike along the Chattooga Headwaters. This hike is moderately strenuous at 4.7 miles and 300 ft. elevation change. Hiking boots are required. Bring plenty of liquids, lunch and $5 for gas if you won’t be driving. For info, call Tucker at 883-8831. HIKERS – On Tuesday, April 8 at 9 am we’ll carpool from the pool parking lot to Caesar’s Head State Park for a loop hike on Cold Spring Branch, Jones Gap, and Tom Miller Trails. This hike is moderately strenuous at 5.7 miles and 1600 ft total ascent. Hiking boots are required. Bring plenty of liquids, lunch and $5 for gas if you won’t be driving. For info, call Tucker at 883-8831. HIKERS On Tuesday, March 27 at 9 am we’ll carpool from the pool parking lot to Sumter National Forest to hike to Lee Falls. This hike is moderate at 3 miles and 500 ft. elevation change. Hiking boots are required. Bring plenty of liquids, lunch and $5 for gas if you won’t be driving. For info, call Tucker at 883-8831. HIKERS On Tuesday, Mar 20 at 9 am we’ll carpool from the pool parking lot to South Carolina to hike to Yellow Branch Falls and Issaqueena Falls. This hike is moderately strenuous at 5.2 miles and 600 ft total ascent. Hiking boots are required. Bring plenty of liquids, lunch and $5 for gas if you won’t be driving. For info, call Paula at 884-8918. HIKERS On Tuesday, Mar 13 at 9 am we’ll carpool from the pool parking lot to South Carolina to hike the Foothills Trail to Laurel Fork Falls. This hike is moderately strenuous at 7.6 miles and 1450 ft total ascent. Hiking boots are required. Bring plenty of liquids, lunch and $5 for gas if you won’t be driving. For info, call Tucker at 883-8831. HIKERS – On Tuesday, Mar 6 at 9 am we’ll carpool from the pool parking lot to Caesar’s Head State Park for a loop hike on Cold Spring Branch, Jones Gap, and Tom Miller Trails. This hike is moderately strenuous at 5.7 miles and 1600 ft total ascent. Hiking boots are required. Bring plenty of liquids, lunch and $5 for gas if you won’t be driving. For info, call Tucker at 883-8831. HIKERS – On Tuesday, Feb 27 at 9 am we’ll carpool from the pool parking lot to Jones Gap State Park for a hike to Rainbow Falls. This hike is moderately strenuous at 4.8 miles and 1500 ft total ascent. Hiking boots are required. Bring plenty of liquids, lunch and $5 for gas if you won’t be driving. For info, call Tucker at 883-8831. See also pictures from December 15, 2015 and February 28, 2017 hikes. Reedy Cove Falls, also known as Twin Falls, is located off Hwy 178 on Cleo Chapman Rd. There are two hikes, first to the top of the falls then a short hike to a lunch spot near the bottom of the falls. HIKERS On Tuesday, Feb 20 at 9 am we’ll carpool from the pool parking lot to South Carolina to hike to Reedy Cove Falls. This hike is moderate at 3.0 miles and 490 ft total ascent. Hiking boots are required. Bring plenty of liquids, lunch and $5 for gas if you won’t be driving. For info, call Tucker at 883-8831. A loop hike to Wintergreen Falls and Thomas Cemetery. The trailhead is located on Sky Valley Rd. HIKERS On Tuesday, Jan 30, at 9 am we’ll carpool from the pool parking lot to Dupont State Forest for a loop hike to Wintergreen Falls. This hike is moderate at 4.7 miles and 490 ft ascent. Hiking boots are required. Bring plenty of liquids, lunch and $5 for gas if you won’t be driving. For info, call Tucker at 883-8831. In and out hike from Asbury Camp to Moonshine Falls. Permission from Asbury Camp is required for this hike. HIKERS On Tuesday, Feb 6, at 9 am we’ll carpool from the pool parking lot to Asbury Camp to hike to Moonshine Falls. This hike is moderately strenuous at 5.3 miles and 840 ft total ascent. Hiking boots are required. Bring plenty of liquids, lunch and $5 for gas if you won’t be driving. For info, call Tucker at 883-8831. October 10, 2017 – POSTPONED! Corn Shoals and Cedar Rock/Big Rock Trails. High Falls on the Thompson River – POSTPONED! Moderately Strenuous. 3.0 miles; 475 ft elevation change , with a knee-deep wade (or higher!). East Fork Pigeon River – In & Out, moderately strenuous, 5.7 miles, 450 ft elevation change, 1060 ft. total ascent.